An off-duty paramedic delivered his daughter on a Chicago expressway early Friday morning, officials said. Daniel Lynch and his wife Elizabeth Lynch welcomed their baby girl Mary Margaret Lynch around 5 a.m. Friday. Daniel was taking Elizabeth, who was in labor, to the hospital via Interstate 94 when she began having her baby. "When I was about to get into the car, I said I don't know if we're gonna make this," Elizabeth said. The couple left their Edison Park home around 4 a.m. and got onto the Edens Expressway at Touhy, but they didn't make it very far. "At that point it was very obvious I was going to deliver a child on the shoulder of the road," Elizabeth said. Daniel, who works as a paramedic, delivered the baby girl in the front seat of the minivan, then drove his wife and child to Evanston Hospital. "Including this baby, this is the first one i've ever delivered," Daniel said. 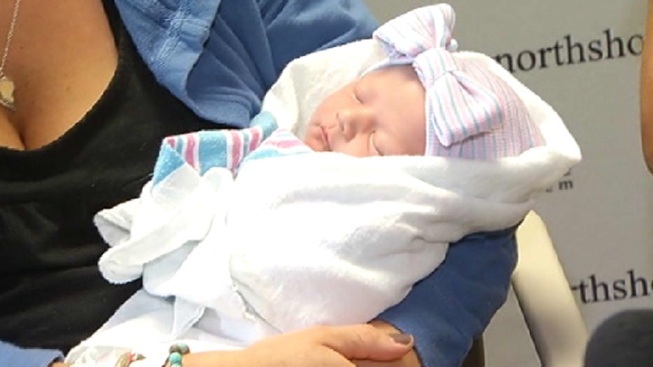 The couple named the baby girl Mary, who was born healthy and weighed 8 pounds, 7 ounces. This is baby number five for the family -- and likely their last. "We're done. We went out with a bang with her," Elizabeth said.